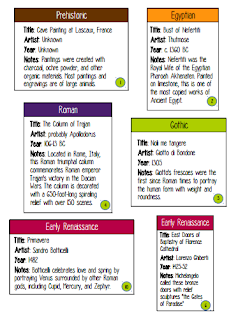 I've got a sample ready of the art history cards, and I'd love your feedback! This picture above shows the front of the cards, while the one below shows the back. I was unable to format the pages so we could just print front and back (groan! ); instead, we'll have to cut and double-side tape the front to the back, and then laminate (of course, it's me!). So, I'm sorry about that, but that's just the way it goes with this. There are over 60 cards covering 25 art periods or movements. And since there are few hard-and-fast rules about what constitutes a movement (especially in the 20th century and beyond) or who was the most influential artist of that period, this little project has turned into a monster! 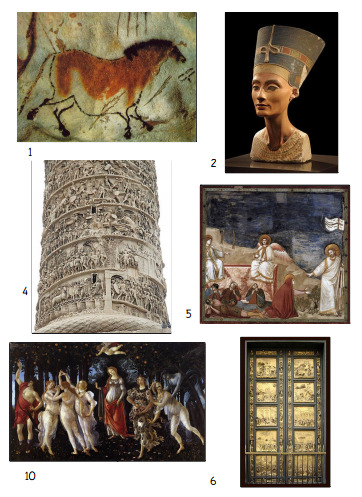 I used a couple of resources as a guide, primarily The Annotated Mona Lisa, Second Edition, by Carol Strickland. 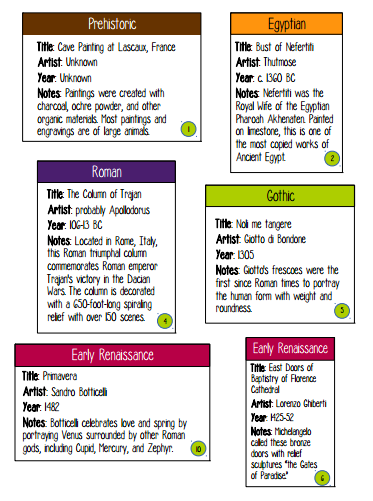 On the timeline card information tables, I've included page numbers that correspond with the art work or artist and the Mona Lisa book, so if you think you'll use these cards, I suggest purchasing the book (it's really good, and it's used in the Classical Conversations Challenge levels!). I'm not finished yet, but I'd love to hear what you think about it so far! Click here to download the first few pages. The artwork is a little out of order at times (you won't see the picture for card #3; it's on a different page), but that shouldn't affect the overall project when it's finished. So, if you have any constructive criticism, I'd love to hear it! Please leave a comment and share your thoughts. Is the font okay? The colors? I'm going to make each card in a particular movement have the same color for easy sorting. Oh, and as a little side note, we've found that we can quickly memorize the time periods by using the tune of We Didn't Start the Fire! Early, High, and Northern Ren-ai-ssance. . .
Love these! I use so many of your resources. Thank you for sharing! I can't wait to see the final project! Thanks, Cathy! It's a slow process, but I'm enjoying it! Wow! I am impressed! They look great - I can't think of anything that I would change! Thanks so much for the feedback, Teri! These look really neat!! I just bought the Art Cards from Memoria Press but these will go great with our CC lessons and Art periods! Thanks, Kara, for taking the time to give me some feedback! Wow! These are wonderful! I am amazed by your giftedness and thankful for your sharing. I love the pics, the idea, the font, the game in general! WELL DONE! : ) Thank YOU! These look great! Can't wait until it's all finished! These are beautiful! I love the font and colors and info. Great job- thank you! Can't wait to see when they are done. Very neat. This is great! I've been wanting the art cards from Memoria, but love how you've covered a broad range of history! Absolutely cannot wait for the final thing... these are beautiful and a blessing... Bravo!